With a journey that spanned times of war and times of peace, times of plenty and times of want, Leonard Engels lived a life of purpose while holding his loved ones near. He was strong and resilient with a courageous spirit and a work ethic that was unmatched. There was no greater joy in Leonard’s life than his family, and over the years he welcomed both children and grandchildren into his heart. Although he experienced so many of the best things that life has to offer, what made these experiences so special was sharing them with the ones he treasured. Life will never be the same without Leonard here, but he leaves behind a timeless legacy that his loved ones will continue to carry on in his footsteps. The 1930s were a time of great trial and hardship in the Netherlands. After the crash of the stock market in October of 1929, the effects were felt worldwide. These harsh realities also lasted much longer in the Netherlands than they did in most other European nations. The ramifications of the Great Depression led not only to unemployment and poverty, but also to increasing social unrest in the Netherlands. 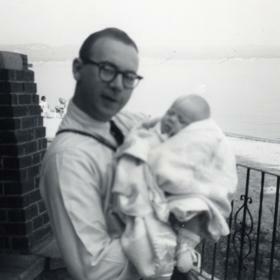 It was during this volatile time that Gerrit and Maria (Verwoert) Engels were able to shift their focus to a time of great celebration in their lives as they announced the birth of the baby boy they named Leonard Fred on May 16, 1935, in Amsterdam, Netherlands. He was one of two children as he was joined in his family by his brother, Jacobus. Life was anything but easy for the Engels family. The German occupation only multiplied the struggles they felt. During the last two years of the occupation there was no electricity, no gas, and no coal as there was only water and very little food. When the Germans turned off the electricity, the street cars stopped in the middle of the street, and they stayed right where they were for the duration of the occupation. Some relief was felt when the Swedish Red Cross shipped in some coal and flour to make bread, and the Allied bombers also provided humanitarian food drops. However, by this time there were already countless casualties of starvation. Brighter days were on the horizon for the Engels family when they came to America in 1949, joining other family members who had come earlier. The family came to Grand Rapids, Michigan, and Leonard enrolled at Union High School. He was not involved in school activities because he had to work part-time to help the family make ends meet, but Leonard did go on to graduate from Union in 1955. With his education behind him, Leonard entered the workforce full-time. 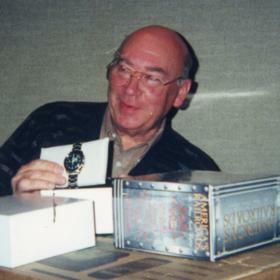 Throughout his entire life he really only had one full-time job as he made his career as a watchmaker for Herkner Jewelers from 1953 until he retired in 1999. While he was busy building his reputation in the business, Leonard’s life was forever changed when he met the woman who would forever hold the key to his heart. Her name was Nellie Palmer, and they met at an evening YWCA group meeting. The two hit if off right away and just knew they would make a good couple. They began getting to know one another and soon found themselves deeply in love. 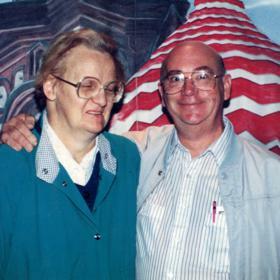 With a desire to establish a new life together they were married in March of 1960. Together they welcomed two daughters, Linda and Carol, into their hearts and home. Although work kept him busy, Leonard did enjoy pursuing some of his interests when he had time. Once their daughters left home he and his wife traveled all around the United States, visiting the East Coast from Maine down through the Carolinas. Their travels also took them to the Midwest and as far west as Colorado, which was Leonard’s favorite place. Trains were his primary hobby, and he had over three thousand pictures in his collection. The railroad system fascinated him, and he was always looking to learn as much as he could about trains. 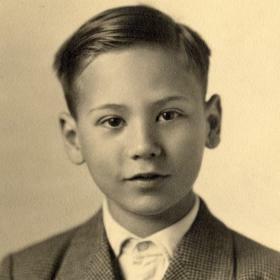 Leonard also loved reading and collected books. When reflecting on the life of Leonard Engels, it is easy to see that he had an insatiable love for life. He worked hard, but he took the time to enjoy life along the way. Although he enjoyed his travels, Leonard also enjoyed being at home, too. With the love of his life by his side for the majority of his life, he made the most of every day he was given. Deeply loved, he will be forever missed. 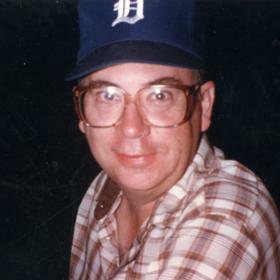 Leonard F. Engels, Grand Rapids, MI, Age 82, passed away on January 24, 2018. Leonard was born May 16, 1935 to the late Gerrit and Maria (Verwoert) Engels in Amsterdam, Netherlands. He was a watchmaker at Herkner Jewelers from 1953 until he retired in 1999. Leonard was preceded in death by his wife of 49 years, Nellie; his brother and sister-in-law, Jacobus and Nellie Engels. He is survived by his daughters, Carol Engels of Grand Rapids, Linda (Chuck) Omlor of Byron Center; and grandchildren, Erin (Tim) Sweeney Yokom of Grand Rapids and Jeffrey Sweeney of Roanoke, VA. A private family service has been held. Interment is in Greenwood Cemetery. In lieu of flowers, memorials may be made to American Cancer Society. Please visit Leonard's personal web page to read more of his life story, leave a memory or condolence at www.lifestorynet.com.